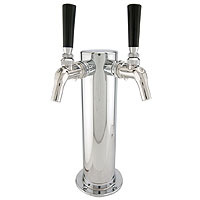 Kegco DT2F-630SS Stainless Dual Tap Draft Tower with two Perlick 630SS stainless faucets. Comments: I'm new to kegging, but after all the complaints I had heard on "standard" faucets- I knew I wanted to give the Perlick faucets a try. The tower looks great, and has some insulation in it, which seems to help keep beer in lines cool. Faucets work as advertised, you turn them off, wait an extra second under that tap- and no drips. Comments: Replaced my original tower, easy to install, just had to drill some holes through top. Faucets are great. Comments: I got these when I was constructing a beer/sparkling water kegerator. I haven't owned beer taps before but wanted to get something good that doesn't leak, has a nice feel and action, and looks nice. These fit the bill great. They don't leak at ALL (maybe after a few drops after filling a glass), they are pretty, include everything needed for install. I only had to replace the connections to fit a corny keg. Highly recommended. Quick shipping from beverage factory. operation. Extremely easy to clean. Everyone that pours a brew out of these can't believe how well they perform. Very pleased and satisfied. Comments: This is the best two tap combo. The Perlick faucets do not 'gum' up like others. Comments: I was upgrading my Danby kegerator so I could place two 1/6 barrels or corny kegs for my homebrew. This required me to drill a couple of holes since this tower is 3" in diameter and the tower that came with the Danby was 2.5". This new tower is solid. Previous reviews indicated the cap at the top was cheaply made, but they must have upgraded it, because it's was definitely steel. The Perlicks are AWESOME!!! Such an easy pour. No sticking like my old faucets. This was deifnitely worth the money. Fore homebrewers: you'll need to cut the end of the lines and replace the barbed nuts for ball lock connectors. Since the line's inner dimensions is 3/16", you'll need to place it boiling hot water to get it to stretch over the 1/4" barb. Comments: After shopping around everywhere for a twin faucet tower for my beer cooler I decided on this offering with double Perlick 630SS's and I couldn't be any happier. I considered the 575SS's with the creamer faucets--which were actually less expensive for some reason--but, after reading a few reviews on those, I decided that was a feature I really didn't need or want. BererageFactory was easily the best price anywhere and, frankly, I was a bit nervous because of that. I shouldn't have been. My order arrived sooner than I expected and well packaged. As soon as I opened the box I was impressed with the quality of the tower and faucets. Both were very solid and obviously of quality construction. The tower is heavy and stout and well insulated. The faucets, which feel weighty and massive in your hand, are packaged separate in the box and will need to be attached to the tower, which was easy to do. I would strongly recommend ordering a faucet wrench, also, if you don't already have one. Using the proper tool will keep you from scratching the faucet or tower when you tighten the nuts. The keg attachment on the end of the tube is ready to thread onto a standard beer keg, which didn't help me since I'm using them with a corny keg setup for home brewing. I had to cut the lines and attach my ball lock fittings, which was no big deal. In about fifteen minutes, I was ready to pour beer! With this package, you get an all--stainless steel beer contact system, with no cheap pot metal ever touching your prized brew on the way to to your glass. The Perlick faucets are a thing of beauty. They pour so perfectly and seal with a solid 'click' when the handle is returned forward. After having two cheap chrome faucets seize up and break, I was more than ready to move up to a quality Perlick that can't stick and is easy to clean, as well as being far more sanitary. I really like the 'P' logo tastefully molded into the face of the faucet, letting all of your guests know that you appreciate fine craftsmanship. I would definitely recommend this package to anyone who wants a quality beer delivery system and is tired of putting up with junk. Two thumbs up for BeverageFactory, also, for their customer service, fast shipping and competitive pricing. Cheers! Comments: Easy install. Great pour. No stick. Beer remains cold in the column. Comments: This tower is just sweet! Very professional grade and works like a charm. You will not be disappointed, buy it! Comments: I recently converted from a single tap to this double. Awesome! It was easy to install and the craftsmanship is impressive... definitely an upgrade. Best bang for your buck conversion! Comments: It installed easy on my Danby kegerator in no time and the faucets are by far, the best on the market. You can't pour a better glass of beer! I also added a second co2 line to make it even better. Comments: Very nice tower. Heavy duty and solid. The only complaint I have, is that it did not come with a ring to hide the mounting screws. Comments: Fit and finish is great, and the kit includes all necessary components right out of the box, very little assembly required. The Perlick reputation speaks for itself, but if you haven't used them previously, this is the only faucet worth your time or money. The handles are cheap, basic plastic, but they are functional. The only complaint would be that if you are using this kit to upgrade or replace your existing tower, the included hardware bolts are too short to go all the way through the fridge top. They are perfect length for conversions, but if you upgrade, you will either need to use your existing hardware, or find a specialty retailer (maybe a marine supply) for 4 1/2" SS Philips oval head machine screws. Comments: This is a top quality item and it is a beautiful addition to any kegerator. I used it on a Danby refrigerator conversion and it looks great. The black plastic knobs were omitted from my original shipment but the seller quickly sent them when I called. Comments: Looks real nice and having the best (Perlick) valves tops it off. Comments: I recently installed this on my newly converted mini fridge kegerator and I'm extrememly happy. You can't find much of a better price on a double with Perlic faucets. It installed super easy with the included hardware and looks fantastic. One of the faucets was a little loose when I received it but after opening it up and tightening the nut it's fine. Don't hesitate to buy this product if you're looking for a double faucet tower.